Wild: Fairly unremarkable by the Island’s standards, Oncorhynchus Grexlamia is a generally passive fish. Far smaller than a human, its main form of protection is swimming in a large school. Oncorhynchus does not like conflict, and generally swims away from anything larger than it at very high speeds. Domesticated: Like many of the smaller fish found on or around the Island, Oncorhynchus can not be tamed, but it is often herded and raised for its resources. In particular, certain cuts of Oncorhynchus meat are considered superb quality, and are often referred to as “Prime Fish” used for specific high-end concoctions. Known Information: Once provoked, however, Oncorhynchus becomes very aggressive along with its nearby brethren. It locks onto the aggressor with its long “saberteeth” and begins draining that creature’s blood. This loss of blood is not too dangerous alone, but when a school of Oncorhynchus attack at once, their would-be aggressor quickly loses speed and stamina from bloodloss, drowning if it cannot breath underwater. 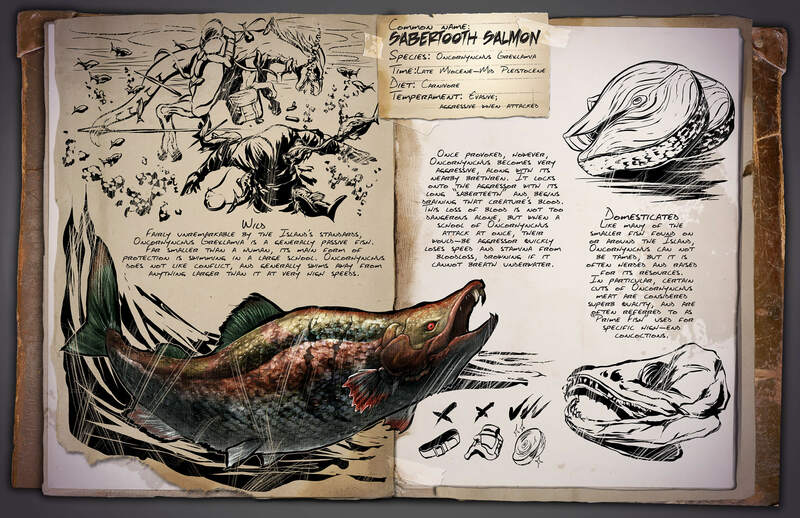 Maybe it is not really an ability, but the dossier talks about “Prime Fish” meat. Currently we only have raw meat or raw prime meat in the game, so this would be a nice addition. It will make the game more diverse in needs of required food, as other creatures could have a preference for fish in stead of normal meat. We’re hoping they will add this creature to the game soon, along with the Ichthyornis that should be able to gather fish autonomously, to see how a new type of food will work out in the current food chain. It will be a cool feature if when they attack you(the player) the rim of the screen will turn slowly white as if it were actually draining your blood!